One of the great things about the off-season is you’re not limited with time. However, if something doesn’t get done, it’s because you made choices about what’s important, and what’s not. You don’t need tools or machinery, you just need some time, a little bit of internet, and the desire to do better than you’ve already done as a team. Here are five things you can label IMPORTANT to get done in the off-season, to make your upcoming 2016 season a good one that’s full of bling and blue banners. 292 and 234 “reflecting” on their stack falling over. Something that is really important to do after such an intense and long season is to look at how everything went. In a perfect world, you’ve jotted down every comment and question from judges immediately after your interaction with them to avoid the anxiety/excitement blackout that follows. But since we all know that didn’t happen as much as you wish it had, get together with your teammates and take a trip down Recycle Rush Lane, and try to remember! Think about the questions judges asked you at in your pit interviews and post presentation questions. If you earned an award, look at what your script for it said, and investigate which of your efforts were most impactful with the judges. Poll your fellow teammates (students, mentors, parents and even the little pre team members who are just fan clubbing it until they can kick it with the cool kids in high school) and find out what they enjoyed doing most. The judges look at scope AND spectrum, so it’s important to find ways to enhance and expand on what you’ve already done to make it even more impactful. Figure out what your team is passionate about, and more importantly, capable of and go from there. What did you do really well, and how can you easily and effectively enhance it? When you’re not shoulder deep in a robot, it’s a good time to get out there and demo how awesome your team is at building robots. Give back to your communities who have supported you with the gift of showing off your robot and amazing people skills that most people assume high school students/millennials don’t have. Demos are also a great place for new/less experienced team members to practice talking in front of a group of people. This will really help come competition season and even pre build when you’re trying to remind your school system and sponsors how important FIRST is. Demo-ing at sport events have become really common in the FRC Community. It’s a fun way to get a crowd of sport loving people to be exposed to robots, your team, FIRST and a great way to get free/discounted tickets to a game! Not to mention the awesome weird mascots you can hang out with! After a fun-filled season, it’s important to take the time to thank your sponsors. A team photo and a letter explaining how their support contributed to the success of each individual student and the team as a whole doesn’t take much time to put together, but will mean a lot to them. Be sure to stay in contact with your sponsors in the Off Season and ask if there’s any opportunities for you to come in and demo your robot. Take Your Child to Work Day and other events are a great way to show off how their money will continue to #MakeThingsBetter for the young minds they support. Also a great way to try to recruit new mentors! Buddy up with a nearby, or far away team to trade and develop ideas. Swapping award submissions and interview questions for feedback gives you a completely different perspective. Partnering up with teams that are struggling is something I strongly recommend in the off-season. For the sake of improving the quality of another team and their members’ experiences and for the sake of spreading your own knowledge. Taking what you’ve learned, whether it be technical knowledge, award submission know how, or even just helping point them in the right direction to find grants or fundraisers, it’s the most awesome thing you can do. 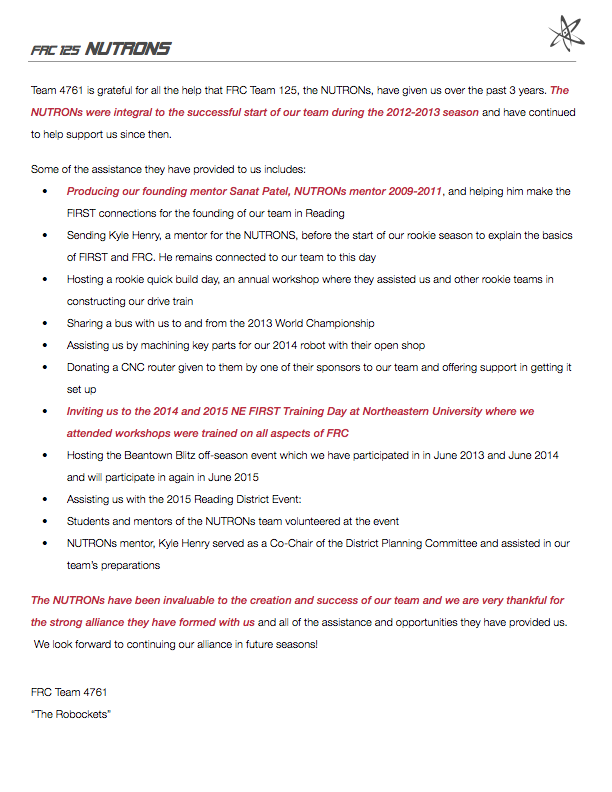 If there are teams you have helped throughout the regular season and off-season, be sure to ask them for a letter of support. A letter of support is a great way to show judges, your school and your sponsors that you’re having a great impact on the FIRST community. It’s also a good idea to ask for letters of support from people and groups that your team has volunteered with (ie, FLL teams, FTC teams, a district you may have been the host team of, etc). When asking for a letter of support, it’s really important and helpful to give them the talking points you’re looking for. For example, if you’re asking for a letter from a team you’ve mentored or consistently helped you can ask them to touch on: What was most helpful, how did it impact your season (or something more specific), what are you looking to do in the future based on the support we’ve provided. Sending out letters to local businesses asking for their support, demo-ing at conventions via FIRST, and applying for ALL THE GRANTS are some of the ways you can network to get flushed with cash. Networking with potential sponsors or sources of money is probably the smartest thing you could do in the off-season, besides working on growing a money tree. Sending out letters to local businesses asking for their support, demo-ing at conventions via FIRST, and applying for ALL THE GRANTS are some of the ways you can network to get flushed with cash. There are so many grants available for teams, both through FIRST and just all over the internet. Spend time sifting through to see what your team is eligible for. Spend time developing a generic essay that you can tweak and modify for each grant application, and it can be used down the line for your Chairman’s submission! If you don’t apply for grants and aren’t swimming in cash, you’re doing it wrong. Free money is great money, and money gets you more robot parts, more competitions, and fun things like team sunglasses and hoodies. 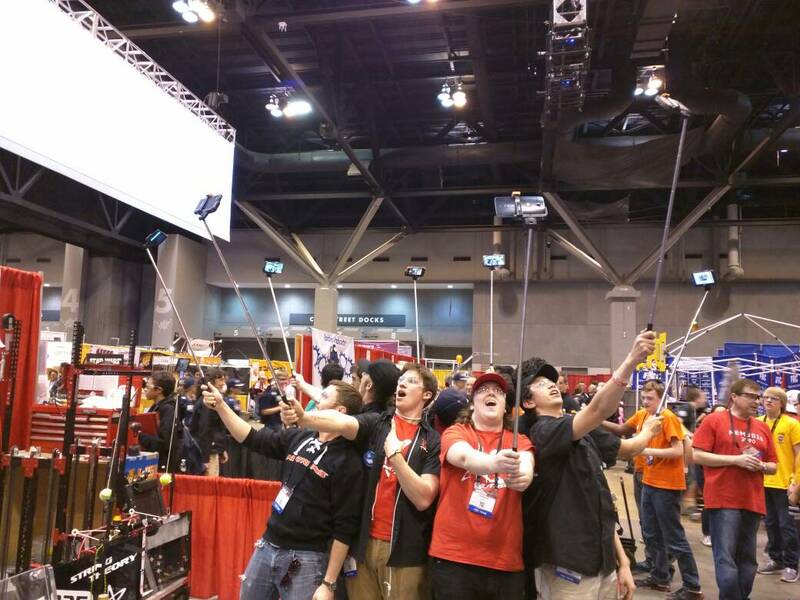 The months where you aren’t building, repairing, and bagging your robot are a great time to sift through all the photos you took of all the great things your team has accomplished. Finding an easily accessible location to store documents and photos is really the key to successfully organizing evidence of your hard work. My recommendation would be to use Slack, however Flickr, DropBox, and Facebook groups are also great tools for doing this as well. Slack however has an app that allows you to directly upload photos, videos and documents from your phone and it’s free…so it kind of rules. Categorizing evidence by your Chairman’s topics will make your life easier down the road. If you don’t have Chairman’s topics here are a few general ones just to get your brain moving: Team History / Team Community Outreach / STEM Outreach / Sponsors / Photos to Laugh at but Not Show the Judges. Having photos and documents categorized will make life easier when you go to apply for all of those amazing grants too! But make sure you have someone who takes photos of pretty much everything you do. You can always delete them, but you can’t magically make them appear out of thin air. And it’s usually pretty obvious when you’ve staged a photo to try to recreate that really great moment you forgot to document. Once you’ve nailed down what went right and not so much as you had planned, figure out where to go from there. Focus on what will make your teammates more successful, what will benefit other teams and communities you’re reaching out to, and what will be most impactful and meaningful. Setting goals for the build and competition season in the off-season is a great way to lay the foundation for the coming competition season. Doing it while you have time to focus on anything, rather than deadlines and finding rule loopholes , is the way to go. Whoever took this photo is a champ. This is an inspiring photo with everyone reaching up together. For all we know they could’ve torn their robot apart like savages or they could be slowly fighting over who gets that intake mechanism, but this is an awesome photo. Bravo to this team and the photographer. These are five things I’ve found work best for teams in my 18 years in FRC. You don’t have to do all of them, but even doing one or some of one will help set your team up for success in the future.